China’s frequent claims on Arunachal Pradesh is in clear violation to the Guiding Principles so far established between the two countries through the Special Representative (SR) Mechanism for resolution of the festering boundary dispute. This observation is made in no uncertain terms by the Parliament’s Standing Committee on External Affairs, whose report on “Sino-India Relations including Doklam, border situation, and cooperation in international organizations” is now placed in both the Houses for discussion. It was submitted in the Lok Sabha on September 4, 2018 by the Committee’s chairperson Dr Shashi Tharoor. Think-tanks working on foreign policy issues have also taken up this report for public discussions involving both China experts and parliamentarians involved with drafting the report. One such discussion took place in the WWF auditorium in Delhi’s Lodhi Road on February 4 in which Shashi Tharoor and CPI(M) MP Mohammed Salim were joined by China expert Lt Gen SL Narasimhan (retiredd) of the National Security Advisory Board. The report says that “one of the guiding principles clearly established that settled populations will not be disturbed.” But it observed that the “Committee are perturbed to note that by constantly claiming parts of Arunachal Pradesh , China is not adhering to this Guiding Principle” established through the signing of the “Agreement on the Political Parameters and Guiding Principles on the settlement of Sino-Indian boundary question” in April 2005. The Committee also noted that Points 12 AND 13 of the written Common Understanding reached between Special Representatives (SRs) in Dec 2012 were ” clearly violated by China during the recent Doklam incident. ” Though the Committee had high hopes on the SR process , they are equally wary of the inconsistencies displayed by China from time to time,”said the report . One Belt One Road Initiative: The One Belt One Road (OBOR) initiative is a Chinese infrastructure project, which includes the China Pakistan Economic Corridor (CPEC). The Committee noted that CPEC is not acceptable to India as it passes through Pakistan Occupied Kashmir, thereby violating India’s territorial integrity. The Committee appreciated India’s stand of firmly rejecting the OBOR initiative proposed by China. It recommended that India should accelerate its own connectivity projects under various initiatives to counter the OBOR Initiative. Further, the Committee recommended that India could use the Asian Infrastructure Investment Bank and the BRICS Development Bank to fund infrastructure projects and improve connectivity in its neighbourhood. Doklam incident: The Committee stated that the Chinese intrusion at Doklam (in Bhutan) was a violation of two agreements between China and Bhutan. These agreements stipulated that there would be no change in the status quo while boundary negotiations were still in progress. Further, it was also in violation of the 2012 Common Understanding, to determine boundary points between India, China and a third country, in consultation with the third country. The Committee commended the overall handling of the crisis, as it sent signals that India would not accept forceful attempts to change the status quo at any of its boundaries. However, it expressed concern that Chinese infrastructure close to the tri-junction had not yet been dismantled. Defence cooperation: The Committee noted that while defence exchanges between India and China has substantially increased, it remained suspended in 2017. This was for various reasons including the Doklam incident and differences on the One Belt One Road initiative. The Committee noted that resumption of defence cooperation will be in the long-term interest of ties with China. It therefore recommended that the government send their proposals for resuming defence exchanges with China. 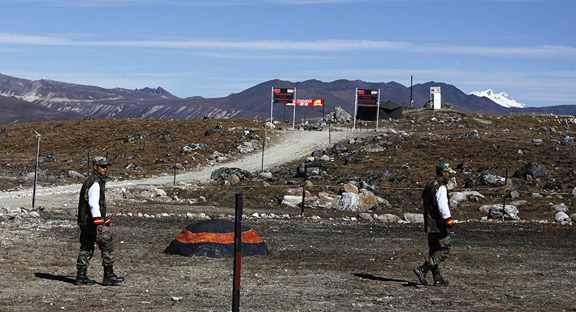 Boundary dispute: The Committee noted that there is no common Line of Actual Control (LAC) in border areas between India and China. The government takes up disputes along the LAC through mechanisms such as Border-Personnel Meetings, Working Mechanism for Consultation and Coordination (WMCC), and diplomatic channels. The Committee recommended that a comprehensive Border Engagement Agreement should be concluded, that subsumes these established mechanisms. Border infrastructure: The Committee observed that infrastructure on the Indo-China border was inadequate and many roads could not withstand military traffic. Further, there were delays in infrastructure projects due to difficult terrain, delays in environmental clearance, and inadequate infrastructure with the Border Roads Organization (BRO). The Committee recommended that the government should make concerted efforts to improve border road infrastructure along the Indo-China border. Further, border roads should be built under the Pradhan Mantri Gram Sadak Yojana scheme, to serve as a back-up for the military during times of emergency. Indo-China trade issues: The Committee noted that bilateral trade between India and China is expected to cross USD 80 billion in 2017. However, the concerns for India include non-tariff barriers imposed by China, dumping of goods, and lack of investment by China. The Committee recommended that India should persuade Chinese companies to bring more investment into India. Further, efforts should be made with China to lower trade barriers at the highest level, including the Ministerial Level Joint Economic Group.